Cranberry walnut conserve is easy to make at home and preserve for use over the next year. It is also impossible to find in stores. 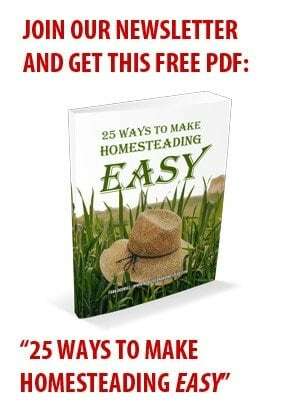 And as a homesteader, you’re all about making as many things by hand that you can and improving the life experiences your family and you have, right? Well, let’s look at how you can treat your family to some delicious cranberry walnut conserve over the holidays. What Is a Conserve, Anyway? Before we even start, we should define some of the terms we use when we discuss preserving foods. Today we will be discussing the step-by-step process to make cranberry walnut conserve. So, just what is a conserve, compared to a jam or a jelly? A conserve is generally defined as a preserved fruit spread that contains more than one type of fruit. Many of the most popular conserves (like cranberry walnut conserve) also contain dried fruits and nuts. A jam is similar to a conserve, except that it normally contains just one type of fruit. A jelly, on the other hand, requires the fruit to be heavily strained, so that only the juice (along with sugar and other ingredients) is preserved; this allows jellies to have a translucent, jewel-like quality. Jams and jellies are generally used as spreads on bread or sandwiches; think of the classic PB & J. Conserves, however, are frequently served as complements to meat dishes. 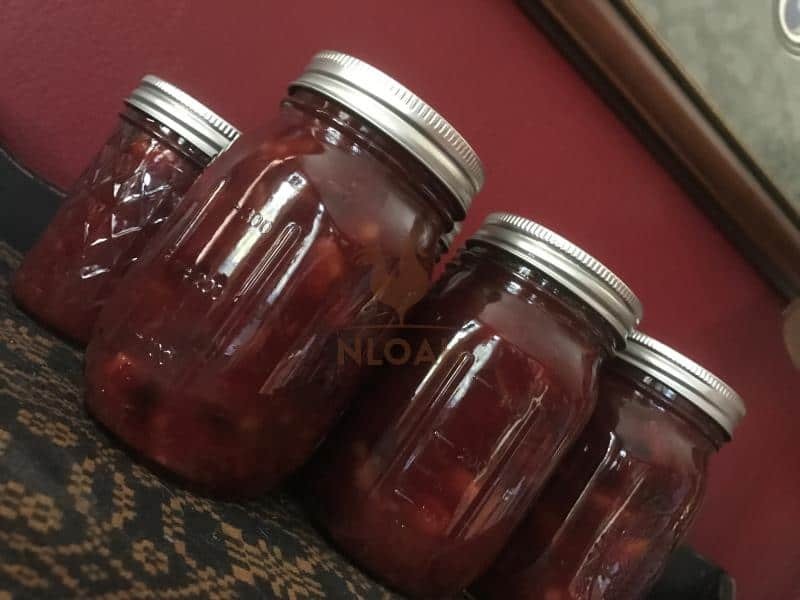 The cranberry walnut conserve we will discuss here is an excellent complement to your holiday turkey, as well as chicken, goose, and other game bird dishes. 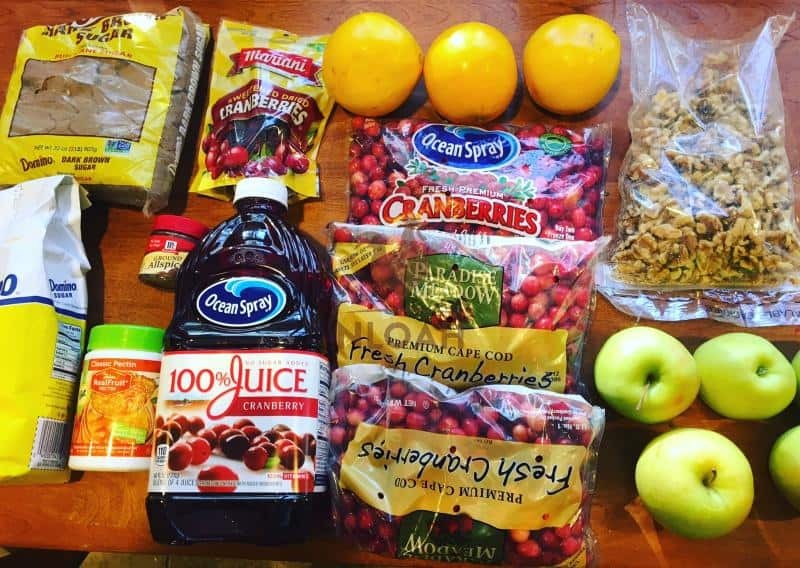 Let’s look at the equipment and ingredients you’ll need to make cranberry walnut conserve. The steps detailed in this recipe will allow you to do two things: first, you’ll be able to make several servings’ worth of cranberry walnut conserve; next, you’ll be able to preserve it in canning jars, so your family can enjoy it all year long. Before you get ready to cook, make sure you have everything on hand to cook and preserve your conserve. That way, you can cook it and can it all in one afternoon. Boiling Water Canner This is the large pot that you will use to sterilize your jars, and then heat process and preserve your cranberry walnut conserve. Canner Rack. A canner rack sits inside your water canner. You’ll use the rack to safely place your jars into and out of the boiling water canner. Five To Six Pint-Sized Canning Jars, With Lids And Rings. You’ll use these jars to preserve your delicious cranberry walnut conserve for use at future meals. One Large Saucepan And One Small Pot. You will cook all of your ingredients together in the saucepan to create your conserve. You will use the small pot to boil and sterilize the lids to your canning jars. One Measuring Cup. You will use one the measuring cup to carefully measure the ingredients you place in your conserve. One Cutting Board. You will need a cutting board, preferably a solid wooden one, to dice up the fruit in this recipe. One Colander Bowl. The colander will allow you to wash and strain the fruits and nuts you use in this recipe. One Large And One Small Mixing Bowl. 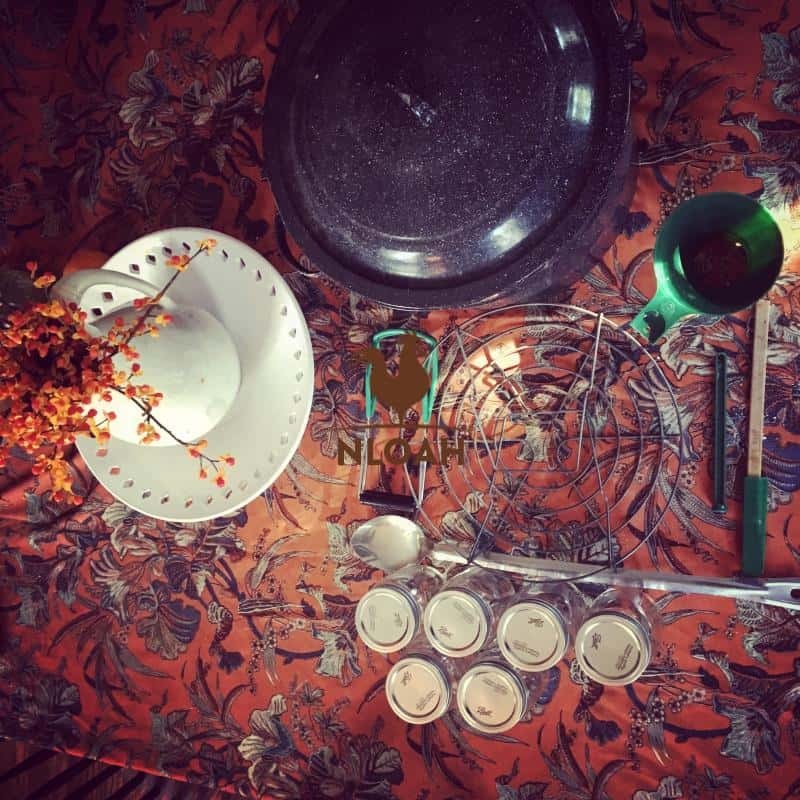 You will store your diced and washed fruits in the large mixing bowl, and the washed walnuts in the small mixing bowl, until you are ready to place them in the saucepan. Spatula And Funnel. You will use a small spatula and funnel to assist with neatly packing the cranberry walnut conserve into your canning jars. Large Spoon. The spoon will help you stir your cranberry walnut conserve as it cooks, and to transfer the conserve from the saucepan into the canning jars. Small Towel. You’ll use a small towel to wipe off your jars and lids; this will help ensure you get a good vacuum seal, so you will be able to store the conserve at room temperature for up to a year. Cranberry walnut conserve is sticky and messy, so having a towel around to wipe the jars clean is important. You will need something to help keep track of time (boiling times, canning processing times, etc.) while you make and preserve your pickled garlic. There are additional items you might want to have on hand as well for this recipe. While they are not essential, they can help make the entire canning process easier. Jar Lifters. A jar lifter is basically a set of wide pincers that enable you to grab hot canning jars and move them into and out of places that are too hot to touch. Labels And Markers. If you can on a regular basis, it is a good idea to label your canning jars, and put a date on when you processed them. This will help ensure that you know exactly what is in each jar. If you write the canning dates on them as well, you will know when a canned food is in danger of expiring. Gas Burner. Unless you have a super-powered cooking stove, it may take some time to get the water boiling in your canner. One solution is to invest in a large gas burner that you can hook up to a propane tank. These burners are normally inexpensive, and can heat up a boiling water canner in just a few minutes, saving you time. Make sure you follow all instructions when using them, and always use the burner outside. It’s easier than ever to find canning supplies these days, since home preserving is enjoying newfound popularity. Most supermarkets have shelf space devoted to canning supplies. Small “mom and pop” hardware stores are also excellent sources of all things related to canning. Finally, you can also shop for them online as well. And when you are safely preserving foods in your home, cleanliness is everything. 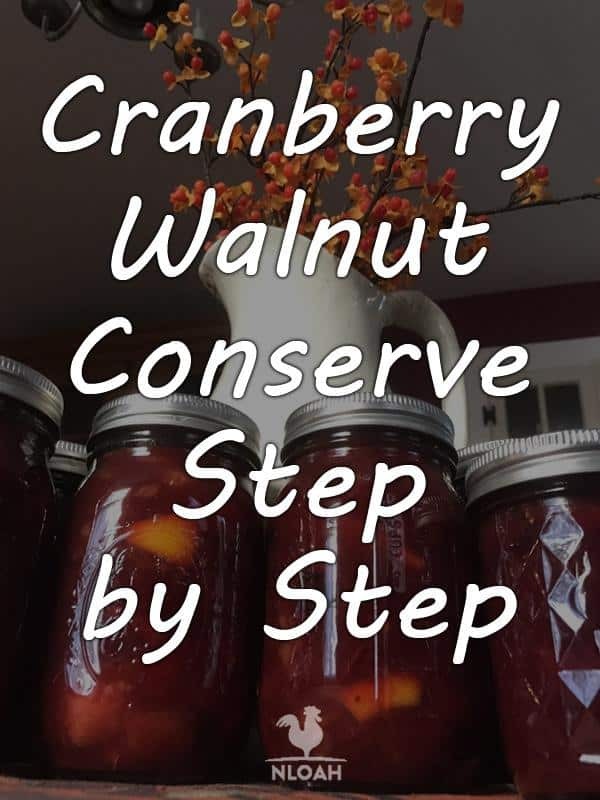 You will want to make certain all of your canning equipment is as clean as possible prior to preparing and preserving your cranberry walnut conserve. I recommend buying and using a good sanitizer, such as Star San, to clean all of your equipment prior to starting out with the recipe. 2 Pounds of Fresh Cranberries. Most stores begin to stock fresh cranberries en masse a week or two prior to Thanksgiving; in Southern New England, they come in one-pound bags, so I designed this recipe based on that. TIP: Immediately after Thanksgiving, most supermarkets discount their cranberries on hand to move them as rapidly as possible. You can often pick up bags of cranberries for pennies on the dollar. So when everyone is going crazy shopping on Black Friday, head to your supermarket and stock up on cranberries. You can pick up a few more bags to make more cranberry walnut conserve or other recipes; you can also freeze them for later use. 2 Cups Of Cored, Diced Green Apples. Try to get the largest, tastiest granny smith apples you can find for this recipe; choose organic apples, or apples fresh from an orchard, if you can get your hands on them. Leave the peels on them. 1 Cup Of Diced Oranges With Peels. Try to use fresh, ripe organic oranges if they are available. Like the apples, remember to leave the peels on the oranges, too, as the peels will give the conserve a great flavor and texture. 1 Cup Of Shelled, halved Walnuts. 1 Cup Of Granulated White Sugar. ½ Teaspoon Of Pectin. Pectin will help to thicken your conserve. You can tinker with this ingredients list slightly if you want to try to give your conserve a different flavor. For example, you can substitute some of the cranberries with blueberries; you can also try some other type of nut besides walnut. However, always try to keep the fruit-to-sugar ratios the same. If you are a new or inexperienced canner, do not substantially deviate from established canning recipes obtained from reliable sources, since experimenting with additional ingredients might affect the food preservation process. Stick to the basics until you become more experienced at preserving foods using the canning method. So, if you have all of your equipment out and your ingredients on hand, it’s time to make some cranberry walnut conserve. Fill your boiling canner with water. Then, place your canning jars on the canning rack, and lower them into your boiling canner. Make sure the jars are completely submerged in the canner, and then boil them for at least ten minutes. Place your canning lids in the small pot, cover them in water, and boil them for at least ten minutes as well. Remove your jars from the canner once they’ve been sterilized, and set them aside to dry out. Use caution when removing the canning jars; do not let a jar with scalding hot water tip and spill on your foot. You can leave the lids in the pot until you’re ready to use them. Go ahead and cut your apples in half, and then remove the core, any seeds, and the stem. Then, dice your apple into 1/8th inch cubes; measure out two cups, and then placed your diced apples into the colander. Repeat this process with the oranges. Wash the apples and oranges thoroughly under cold water, strain them, and then place the clean fruits in the mixing bowl. Load your cranberries in the colander and wash them as well, placing them in the mixing bowl with the other fruit once they’re clean. After you’ve cleaned off all of your fruits, repeat this process with your walnuts, and placed the clean nuts in the small mixing bowl. Use your spoon to stir and mix the fruits in the mixing bowl together thoroughly. Then set aside the two mixing bowls for a moment. In your saucepan over high heat, combine your cranberry juice and water. When it begins to boil, add the entire bowl of fruit, along with the allspice. Reduce the temperature on your burner to medium high heat, and let the mixture simmer, stirring constantly for twenty minutes. 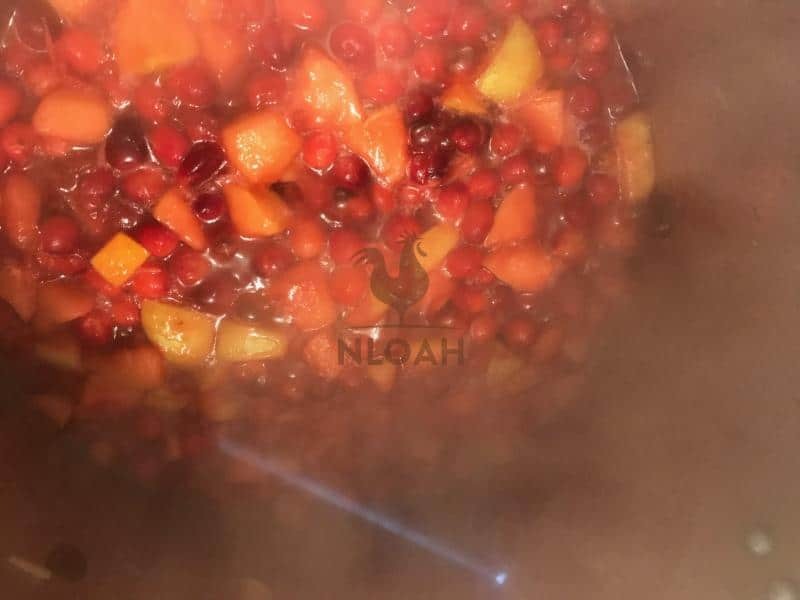 As you stir, you will observe the cranberries dissolving, and the mixture becoming thicker. At twenty minutes, sprinkle your pectin into the mixture, stirring it in until it completely dissolves. Add the sugar all at once, and raise the heat to high again for one minute, stirring the sugar in until it completely dissolves. Add the walnuts, reduce the saucepan to medium heat for three more minutes, then remove it from the heat altogether. Cover the saucepan and set it temporarily aside. Note: At this point, if you only intend to eat your conserve with a big holiday meal in a day or two, go ahead and wait until it cools, pack it in plastic containers, and store it in your fridge. It will keep fresh in a refrigerator for several days. If you wish to preserve your conserve so that you can enjoy it weeks or months from now, move on to step four below. Move the saucepan with your conserve, along with your canning jars, to a place where you have enough space to move around and work with both of them. A large table or counter area will work for this task. Line up your jars neatly, so they are easy to work with. Place your canning funnel on the first jar. Then, using your spoon, load the first jar with the conserve, up until approximately ¼ inch from the jar’s opening. Use the ladle to gently ensure the jar is sufficiently packed with conserve, and there are no big air pockets in the jar. Repeat with each successive jar, until all of your jars are filled. You may wind up with more or less than five pints of conserve, depending on how it all cooked out. However, only move on to the next step with jars that are completely filled with the conserve mixture. If you have any remaining conserve that cannot fill an entire jar, refrigerate it and eat it like any other perishable fruit. Once all of your jars are filled, use your small towel to wipe off the rims of your canning jars; conserve can be a sticky, drippy mess, and could end up on your jar neck and in the way of a good vacuum seal. Use your magnetic wand to grab a sterilized lid, and place it center of mass on the top of our first jar. Grab a ring and screw it on carefully, until you meet a slight resistance. Make sure one last time that the lid is aligned properly on the top of the jar, and then screw the lid with your hands until it is “finger tight.” Repeat with each jar until all of them have lids. Once you have placed all of the lids on your filled jars, it is time to process them. Heat processing will preserve your conserve so that you can store it in canning jars at room temperature, and consume it at a later date. There are two components to this when it comes to canning, both of which are accomplished by boiling your glass jars: first, the boiling destroys any harmful microorganisms in the jars; next, boiling the jars, with their metal lids, help creates an airtight vacuum seal. After successful processing, your cranberry walnut conserve can be stored in your cupboard or pantry for up to one year. To process your conserve jars, place all of them on your canner rack. Then, carefully place the rack back into your boiling water canner. Be careful, the water may still be very hot from when you sterilized your jars earlier. Make sure that jars are upright; use your spatula or jar lifter to set any jars straight that inadvertently tip over. Also, ensure that there is at least one inch of water covering all of the jars’ lids inside the canner; add additional water if there is not enough. Once your canner is filled, set the heat to high. Bring the water inside to a rolling boil, and let it boil covered for ten minutes. After ten minutes, turn off the heat, remove the lid from the canner, and let everything sit for at least five minutes to cool down. After five minutes, carefully remove the canning rack with the pint jars of cranberry walnut conserve from the boiler. Using your jar lifter or small towel, move each jar to a cool dry place, away from any drafts. Place all of your jars together, and then cover with the large towel. Let the jars sit like this for at least twenty-four hours. After twenty-four hours, remove the towel, and inspect each of your jars of conserve for a vacuum seal. A sealed lid will be concave (curving downward into the jar). To check further that each jar sealed, press lightly down on the center of the lid; it should have no “give” in it. Any jar that has not vacuum-sealed effectively will allow you to press it down significantly, like the “Home” button on a smartphone. If you find a jar that has not sealed successfully, you can attempt to repeat the processing techniques described in Step 5. However, it is likely that you have a defective lid; it may be better to just refrigerate this particular jar, and consume it immediately. All of the jars that vacuum-sealed successfully can be stored at room temperature in a cupboard or pantry for up to a year. Keep in mind that once you break a seal and open a jar, it must either be consumed immediately or refrigerated. You cannot seal the jar back up and store it at room temperature once it’s been opened. Conserve, of course, is a terrific complement to your Thanksgiving or Christmas Turkey. A serving of the delicious, bejeweled red conserve, alongside the bird, some orange sweet potatoes, brown stuffing, and green beans, will brighten up an already festive holiday meal. Conserve is great to serve as a spread on a leftover Thanksgiving turkey sandwich as well. Cranberry walnut conserve also goes great with other poultry dishes. Serve it alongside wild pheasant and rice, or with roasted duck and baked potatoes. This conserve goes well with pork dishes as well. The brilliant colors of cranberry walnut conserve add excitement to any dish. So save those jars for special occasions when you have company. Or double the ingredients in this recipe, and make larger batches of conserve to enjoy more frequently! Cranberry walnut conserve is a delicious side dish. And you’ll never enjoy it unless you make it yourself, since it isn’t available in any grocery store. Fortunately, this conserve is very easy to prepare and to preserve. So what are you waiting for? Thanksgiving and Christmas are right around the corner. Go to the grocery store, pick up the ingredients, and cook up some delicious cranberry walnut conserve today! What a delightful treat. Thank you for sharing. Have you ever used black walnuts for this recipe?